The department is responsible for overall management of surface and groundwater in NSW. We assess the impacts that developments such as mining and coal seam gas extraction may have on the state's water resources. The NSW government maintains a groundwater database that includes information on the depth of each bore, the rock types that have been drilled, the depth of aquifers intersected by the bore, the depth to water in the completed bore and the estimated bore yield. The bore's casing details are also supplied. This information is very useful for gaining insight into the groundwater conditions in an area. Real time data on water levels and trends can be viewed on the groundwater monitoring overview map of NSW. By selecting any site you can click through to the detailed data for that bore location. Coal seam gas (CSG) is a form of natural gas that occurs in coal seams laid down mainly during the Permian period, between 299 million and 251 million years ago. In NSW the coal seams targeted for gas production are generally found between 200 metres and 1000 metres below the ground. CSG is typically 95 to 97% methane (CH4) with minor amounts of nitrogen, carbon dioxide and other gases. In the USA much of the methane being extracted is in shale. CSG differs from shale gas in a number of ways. Shale gas comes from shale which is a hard sedimentary rock with low permeability. That is, rock that does not allow water or gas to pass through easily. Because of this, shale generally requires extensive hydraulic fracturing to extract the gas. There is little interest in gas extraction from shale in NSW, largely because of the significant coal deposits and the added difficulties and costs involved. Coal seam gas does not generally require hydraulic fracturing for its extraction. It is the exception rather than the rule. To date less than 5% of CSG wells in Australia have been fracked, and this figure is unlikely to exceed 10%. Why extract coal seam gas? As energy demands continue to grow in Australia, CSG has the potential to become an important energy source. CSG is used for heating and cooking, it is used to produce electricity by fuelling large electricity generators and it can be converted to liquefied natural gas (LNG). CSG burns cleaner and more efficiently than coal and is an alternative lower carbon energy source producing less greenhouse gas emissions than coal per unit of energy supplied. CSG occurs within the coal seam bed itself. This is different from natural gas traps that occur in geological structures. The gas within coal seam beds is kept in place by the pressure of groundwater and the overlying geological formations. To extract the gas, the pressure of the water in the coal seam must be lowered. This is done by pumping water from the coal seam to the ground surface through a specially constructed well. 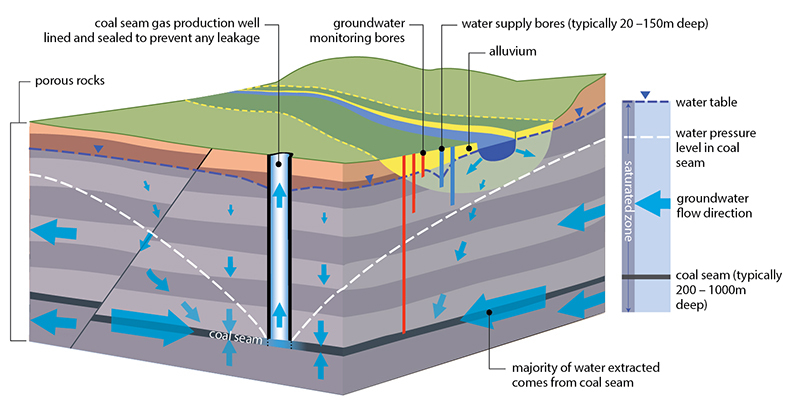 The following diagram shows what happens to groundwater flow when a coal seam gas production bore is operating. In most situations the vertical component of water flow is much smaller than the horizontal component as shown by the arrow sizes. Download a schematic diagram ((JPG 195.4 KB)) of groundwater flow in vicinity of coal seam gas production well. How are coal seam gas impacts on water regulated? Exploration and production activities for CSG and their potential impacts on water sources are regulated by both NSW and Commonwealth government agencies. Over the past two years a number of measures including legislation, policies, plans, guidelines and codes of practice have been introduced by the NSW Government to ensure stringent regulation of the CSG industry in the state. In 2011 the NSW Government banned the use of BTEX chemicals (benzene, toluene, ethylbenzene and xylene compounds) in CSG fracking fluids and banned the use of evaporation basins for the disposal of CSG produced water. The NSW Aquifer Interference Policy was released in September 2012 and ensures that the impacts of CSG and other mining developments on groundwater resources are now subject to greater scrutiny and control. The Aquifer Interference Policy sets out licensing requirements for the water taken from water sources through CSG and other mining activities. It also defines the process through which the NSW Office of Water will assess projects to determine any potential impacts on aquifers. The assessment process will be based on 'minimal impact considerations' including the potential risk of groundwater movement between aquifers, impacts on the water table, water pressure levels and water quality changes in different types of groundwater systems. The Office of Water will assess each application against the requirements in the Aquifer Interference Policy and will then advise either the Minister for Resources and Energy, the Gateway Panel, the Planning Assessment Commission or the Minister for Planning, depending on the nature of the proposed development. Two codes of practice applying to hydraulic fracturing and CSG developments were released by the NSW Government in 2012 to strengthen the controls applying to gas exploration and production. The NSW Government will also establish a best practice framework for coal seam gas exploration activities in NSW, including the protection of water sources, through a Code of Practice for Coal Seam Gas Exploration.